I will never forget the words of the sonographer at our 12-week scan. He exclaimed, “there’s one baby”, followed by “there’s another baby”. We stared in amazement and disbelief at the screen and saw 2 beating hearts. Elliott and I had decided only 12 weeks earlier that we’d like to start trying for a family. We had a week long skiing trip during which I thought the fondue had made me feel sick the entire holiday, but in actual fact it was morning sickness caused by two tiny babies. We continued with our day-to-day life, tying to anticipate and prepare for what life might be like with not only one baby, but two. I have never felt so sick in my entire life. It was like an endless hangover. The relief when the sickness left me at 18 weeks was incredible. I continued to swim, practice yoga and go to the gym up until a routine scan at 23 weeks when our consultant discovered my cervix was extremely short. It was recommended I should slow down with everything, as there was a high chance of premature labour and of being put on bed rest because of my short cervix. In any other circumstance I would have protested this wasn’t necessary. The scary truth that my babies might arrive far too early led me to giving up all exercise and I worked from my sofa at home whenever possible. Each week I went to my 2 appointments at Chelsea & Westminster Hospital and came home having been told my cervix had shortened a little more. Absolutely terrifying when something is so out of your control. The hospital prepared us for the babies to arrive at 26 weeks. It would be a real bonus if the babies stayed put for any time after that. Finally my cervix stabilized, so no bed rest but I had to stay sitting down and resting as much as possible. The days and weeks passed slowly. Much to the hospital’s, and our, total amazement we reached our planned cesarean section date at 37+5 days. I’m totally convinced, eating really well, drinking loads of water and all the resting helped. The night before your twins arrive by planned cesarean section must be one of the most crazy and surreal situations. It’s so exciting to know you’re going to meet your babies and just desperate not to be pregnant any more. At the same time you’re so nervous for their safe arrival and contemplating if you’re ready and capable to look after two babies. 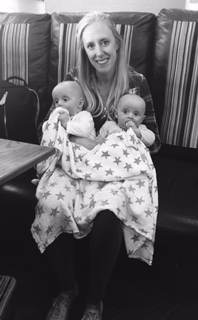 We were incredibly lucky to have a perfect cesarean section, Max and Dillan arriving a minute apart, weighing exactly the same. We had been advised a cesarean would be the safest delivery option as Max, twin 1, had been breech throughout our whole pregnancy. I had originally felt sad at this mode of delivery, as this might be my only pregnancy and birth however I quickly accepted the situation for exactly what is was, the delivery option with the least risk for all 3 of us. We then spent 3 very uncomfortable nights in hospital. The 4 of us squeezed into a tiny hospital cubicle, with Elliott sleeping in the chair, babies everywhere. We were so desperate to get home for the fun to begin. After a rocky start I managed to breastfeed for an entire year thanks to enormous support from my family, friends and being extremely determined and dedicating myself entirely to it. This meant I spent a lot of time back on that sofa that I was so desperate to get off during my pregnancy! Max and Dillan are now 2 years and 3 months. The boys have made us feel more complete than anything ever has and drink more wine than anything ever has! They are now at an age where we can go on adventures together. I love watching them grow and their excitement over the smallest things in life. I can’t wait to watch their relationship grow. How lucky to have your best friend with you always.